Patient loyalty: How healthy is your practice? How do you make the invisible, visible? We did just that to help Crosstex market their protective face masks. 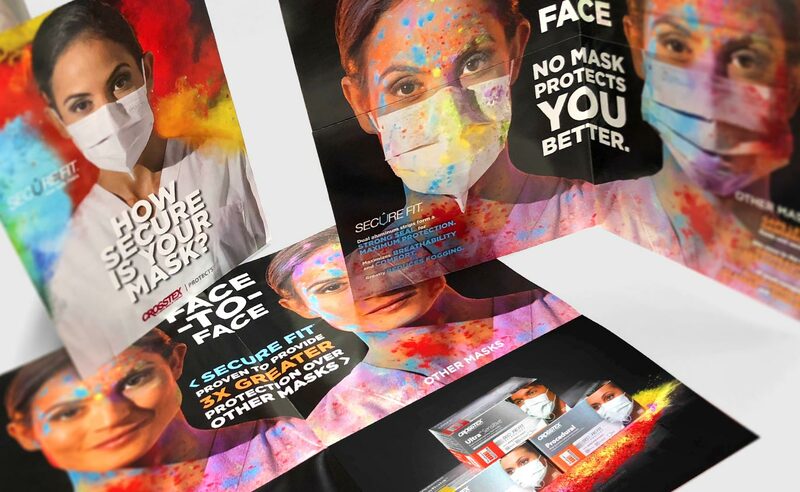 The SecureFit® Challenge uses vibrant-colored powder to provide a literal face-to-face comparison of a SecureFit mask with a standard one and vividly demonstrate the superiority of our client’s patent-pending design. SecureFit went face-to-face with the competition in this foldout brochure insert atop the industry’s leading product catalog. A behind-the-scenes short—excerpted from our product video—got the sales force pumped and ready for action. All marketing drove to a landing page architected to stimulate trial and drive sales.